Razor bumps can occur on the face of any man who shaves, but if you throw curly hair into the mix, the likelihood of razor bumps popping up increases dramatically. 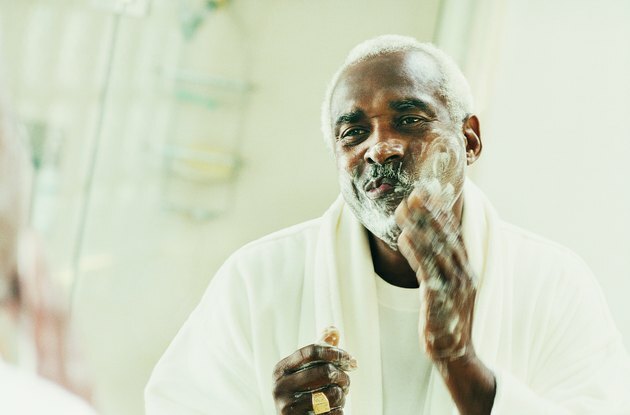 African-American men typically have wiry and curly facial hair, which more readily coils back underneath the skin after shaving, causing these unsightly and often painful bumps. But if you shave correctly and treat your skin right prior to and after shaving, soft and bump-free skin is more likely to be yours when you step out of the bathroom. Shave with a sharp, single-edge razor blade. Avoid using razors with more than one blade, as they give a closer shave. Shaving too close to the skin will cut the hair at a level that lies beneath the surface of the skin, which will increase the possibility that curly hair will curl downwards and back into the skin before it has the chance to break the surface of the skin. You should only use a razor blade about four to five times before tossing it out. Dull blades force you to go over the same area repeatedly, which can lead to irritation and razor bumps. Exfoliate your skin with an exfoliating scrub and warm water prior to shaving. This will help to clear out the pores, remove dead skin and even the skin tone. After exfoliating, massage warm water into the hair you’ll be shaving to help soften the hairs. Apply a thick layer of moisturizing shaving cream to the wet hair. Leave the shaving cream to sit on your skin for about one minute before shaving to allow it to completely coat the hairs. Shave in the direction that the hair is growing, rather than in the opposite direction. Shaving in the opposite direction of the hair growth gives you a closer shave, but black men should be aiming for a clean shave over a close shave. Avoid pulling the skin taut while shaving, and don’t go over the same area more than a couple of times, as this, too, will shave the hair too closely. Rinse your skin with cool water and pat it dry with a soft towel. Apply a hydrating aftershave solution to your skin immediately after shaving. Look for products that contain ingredients like tea tree oil, witch hazel or aloe. These products will reduce discomfort and redness and help to prevent razor bumps. Stay away from alcohol-based products, which can dry out the skin and give it an ashy appearance. Keep yourself on a consistent shaving schedule. Shave every two days -- instead of every day -- so the skin has time to heal, but the hair doesn’t have time to curl back into the skin. The first day after shaving, gently massage the freshly shaven skin with a dry washcloth before bed to help loosen and remove dead skin, as this helps to prevent hairs from curling back into the skin. If you have razor bumps, don’t shave until all of the bumps are gone. Apply a warm compress to the area several times a day to help open the pores and ease the discomfort.